I am so in love with vintage inspired hair accessories. I especially love feather fascinators and vintage combs. So I decided to go about making some of my own. It was really simple and fun. Anyone can do it. I broke it down into 10 simple steps just for you dear readers. You could even skip a few steps if you like (the written instructions are below the following images). 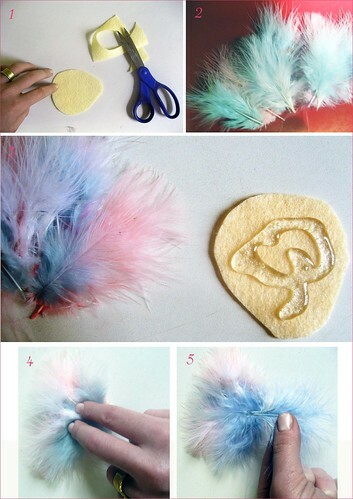 Materials: All you’ll need is felt, feathers, a ribbon, a button, and hot glue. If you want, you can use leather instead of felt for the base and fabric instead of feathers for the decorative part. 2. Pick your feathers. I like mixing colors a bit (the combo above is a light turquoise, white, and some light pink ones in the back, just to peek through a bit). I like to lay them out in a little fan array at this step. 3-4. Hot glue a blob on the leather or felt base. Carefully lay the feathers over it a few at a time (you can wear gloves if you like or a sewing thimble (I like to risk it but hot glue burns are really painful so it’s your call). Press down once you’ve laid the top layer of feathers on. The hot glue seeps through enough to stick them all. 5. (optional) lay one feather facing the other direction (this makes the feathers less of a fan shape and more of a cloche shape). 6. Cut concentric circles out of ribbon, one smaller than the next and glue them into a little flower shape. Or skip all of this a use a button (see photos above for examples). 7. Glue ribbon flower or button over the feather convergence point (where the stems meet). This step helps hold everything together and hides glue. 8. Glue two little drops of glue across width of base leather or felt. 9. Cut leather or felt strip and place over glue drops. Make certain the center is not glued down. 10. Add bobby pin and then you can clip into your hair. I usually need two. I have curly hair. You can also hot glue a barrette, comb, head band, or hair band onto the back. It’s your aesthetic call. And that’s it! Pretty easy right? You’ll probably want to make a bunch once you get started. Won’t these be great gifts for the holidays or for a wedding party or something? 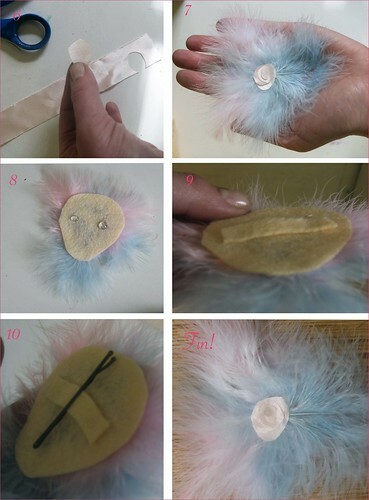 42 Responses to 10 easy steps to making your own hair accessory! LOVE. Thanks for the great tutorial and inspiration! So glad you like! Let me know if you try to make one, send me a picture!! This is fabulous, thanks so much for sharing! I’ll be linking to this. Thank you so much Amy!!! They’re super easy to make. I just used the cheapest feathers. I should make one that uses nicer ones….and make it really fancy!!!! Hope to see you Sat.! Wonderful Rachel!! I will def check one pretty thing!!!! I know now more Christmas gifts I can make! oh great!!! So happy to have helped you out Celia!! Def take a snap shot of the ones you make and I’ll post them on maquette! Thanks so much! It’s been there for a couple of weeks but I suppose that’s new…..just in the blog world that’s like 60000 years old. that’s weird, it never shows up on my laptop–I am using the big computer tonight. well tell HAL I said hi! i went out with my friends to the craft store yesterday because i told them about your hair accessories tutorial. one of my friends bought a ton of feathers, and she made a bunch for herself 🙂 i’d like to make a blinged out one with a TON of sew on rhinestones. i wouldn’t know where to wear it though. Oh my gosh, that is so awesome!!!!! Please please send photos of you and your friends in the hair accessories you make!! Make a wild one and an event will present itself to wear it! I can’t wait to see what you come up with! Cute tutorial – thanks for sharing! Thanks so much Sarah! I can’t wait to check out geek + nerd!! Hi, I was wondering if you knew of a website that can show me how to make bridal head pieces out of feathers. or follow my tutorial with white feathers or try etsy for lots of handmade looks. Go for it! I know you can do it! Send a pic when you do! Hey Samantha, thanks for the awesome tutorial! Any ideas on where to get feathers? I looked in some local craft stores and couldn’t find a thing! Where did you get yours? Any online dealers? Thanks so much and sorry if you answered these questions already:P! Hope you make something great! I think it would be a wonderful and simple project to do. I really enjoy it! Thanks for sharing this with us, all the step by step photos really helped! yes, it really is quite simple and fun to do. What a great simple idea..thank you. Can you use fabric glue instead og a hot glue? You could use fabric glue, it would take more patience though. I also think it might be a little hard as the feathers might start to curl up in the glue before it dries. I would try it though! I bet you could also do this with a needle and thread. Threading each feather onto the felt base. Maybe some gold thin twine or something? Let me know how it goes if you try it with fabric glue. Enjoy! Awesome. I make hair luxury hair accessories for Henri Bendel’s NYC. This is great for creative girls on a budget! One of my pieces will set you back 100.00 bucks so it’s great to see it available to every savy consumer. I target the 5th Avenue set but it’s great to see something accessible to everyone. 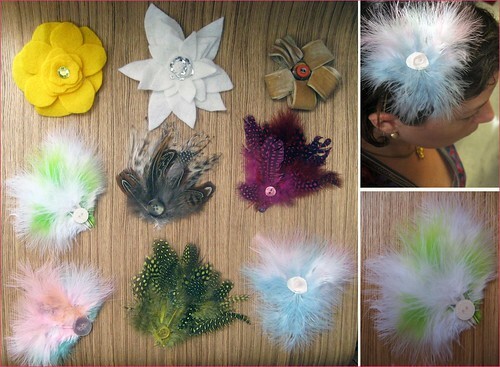 I would recommend using high end fabrics and feathers to give the hair accessories a polished professional feel. There’s no substitute for craftmanship like yours, these are certainly fun though for an everyday accessory and they’re easy to make. I’m sure yours are lux! Hey, I was just attempting to make a chiffon flower hair accessory myself and i was searching around for what material would be a great base to use and came across your article! A long time ago when i tried to make a fascinator i resorted to using a small piece of cardboard (wrapped in fabric) cos I couldn’t find anything hard enough! But i think the glue will stiffen the felt a little right? a little but you don’t need too much glue…so it shouldn’t be a problem. Hya, my sister is getting married on Friday and I have been looking around the stores for something like this for myself and my daughter but they are so pricy, needed some car ribbon also, so called in at a Hobbycraft store, saw the feathers, bought them and wasn’t sure what to do next, hence I looked on here and bingo, brilliant. I bought combs too though not sure whether to use them, but thanx I have a new inspiration. So happy to hear that! I bet you and your daughter looked fabulous!! You’ve helped me get started on a new crafting direction! Thank you. Thanks for these tips, definitely will try them. I would have never though these where so easy to make. Thanks for the post.